Your speed. Your key. And now on your Mac too! We are pleased to announce that the world's most popular pitch changing software for Windows is now available for Mac OSX! 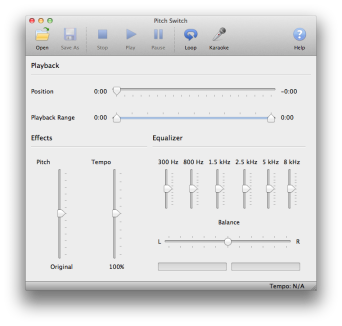 Pitch Switch is the fast, easy way to change the tempo or key of virtually any music file on your Mac. Just open up your favorite music and use the "Pitch" and "Tempo" sliders. Like magic your songs are automatically adjusted to suit your needs, right before your ears! Your software is the best one out there. I mean all I have to say is WOW!